After the intensive and nerve-racking reentry months, showing no sign of abating, I thought that time to take a break would be appropriate. That is turning the TV and radio off, avoiding reading newspaper and magazine, and ignoring the nudges from Facebook and the likes. It is surprising how quickly we can remember that the sky is blue, and not contaminated by everything taking place in DC and the White House. Spring is breathing down our neck, and, despite the last lagging blast of winter, I feel confident we’ll get to brighter days before we know it. Here is a selection to reflect the change of mood. Some novels are simply born to become films. 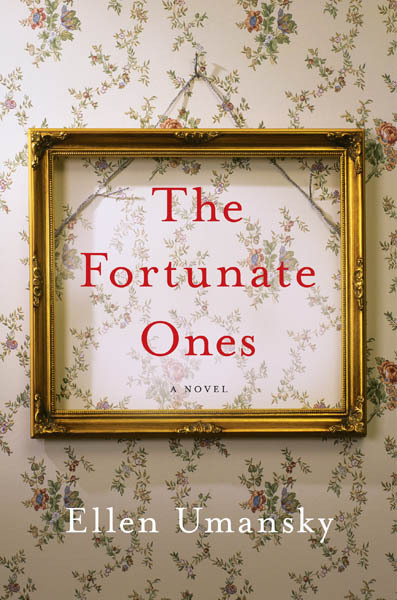 “The Fortunate Ones,” the first novel by the talented Ellen Umansky pertains to this category. Upon opening the first pages of her captivating story, one can see the credits rolling on the page. The setting immerses us at once in a intimate spectacle. We are in Vienna, in 1936, with a scene where life seems normal. There is food on the table and a conversation about a painting. Yet, a palpable underlying anxiety impregnates the Zimmer family, who knows that dark forces are simmering. Cut to Los Angeles 2005. Another story thread begins. Lizzy Goldstein is watching the casket of her father being lowered down . . .
Do not be deceived however by this dark opening. The novel is not a rollercoaster through hell. Hell there is, but also warm reconciliation. Umansky has done a remarkable job to align her visual writing style to the theme of the novel. The thread between these split narratives hinges on a painting. A Chaim Soutine portrait, which first belonged to the Zimmers and ended up years later in the hands of the Goldsteins, before it was stolen from them. The vivid descriptions are as crisp as the relationship that develops between the two main characters. Rose who was sent away during the war in England is looking for the painting that meant so much to her mother. She meets Lizzy and finds solace and acceptance for the burden of the past. A situation not foreign to Soutine’s when in arrived in Paris penniless. Like countless artistic dissidents after WWI, he found a community of like-minded to support his creativity and give meaning to his art. A gift he left for future generations, just like this remarkable novel. If there is a sure sign to guarantee the success of a book, perhaps the intensity of the stakes should be the measure. Some stakes are more interesting than others. Often simplicity is the name of the winner. 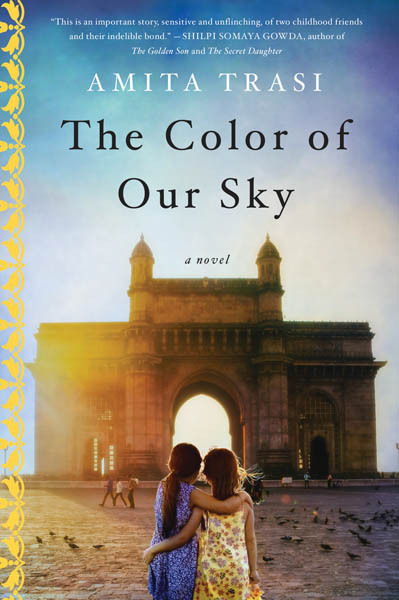 In Amita Trasi’s moving first novel, “The Color of the Sky,” though story simplicity reigns, the emotional line will not let you catch up your breath. Not surprising that when first self-published in 2015, the book headed straight to the best-sellers. Though there is no way of knowing how much was edited out in this current version, one thing remains. The gem at the core of the story already existed. This is the sort of novel you have to read in one sitting to find out the outcome of the nightmarish dilemma that keeps you riveted. Starting in 1986 and spanning three decades, the story revolves first around, Mukta, a ten-year-old lower cast girl in India, who is destined to become a prostitute, like her mother and ancestors. But fate smiles at her, and Mukta is sent away to Mumbai to work for a wealthy family. There, she strikes an unlikely friendship with Tara, the daughter of the family. Seven years later however, Mukta is kidnapped from the family, and Tara must follow her father to Los Angeles. Tara has a new life, and yet, the thought of Mutka never leaves her in peace. Years go by, and Tara, now an adult, returns to India determined to find her old friend into the heart-wrenching world of human trafficking. Her search however leads her to unexpected discoveries about her own family, and the role Mukta played in it. An emotional journey that will leave you raw. There are times when a certain type of books lands on your desk and you recline as you ponder how to review it. There are obvious reasons for this rumination. The topic at hand is so monumental that it requires a book length commentary to deserve proper attention. Or perhaps the reviewer has explored that same topic at length and has drawn a set of conclusions that makes impartiality to the content of the book difficult to exercise. When this is the case, best panacea is to leave one’s beliefs in the closet and focus instead on the intention the book sought to provide. 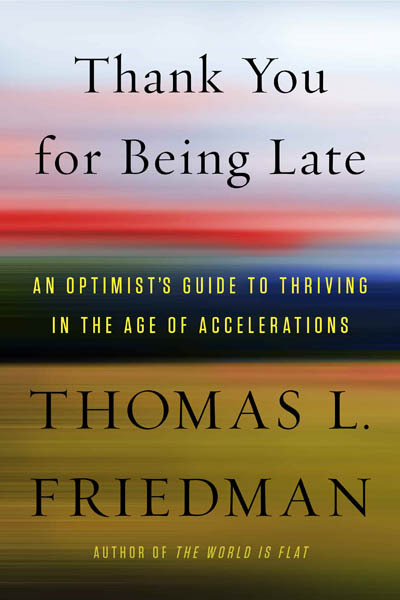 Thomas L. Friedman’s new book, “Thank You for Being Late” falls into such door stompers. It is a loud book that should be compulsory read. “Thank You” does not shy away from attempting to capture the fast raising temperature our culture and society is undergoing, and Friedman, despite casting a wide net, succeeds in locating the hot spots. His prose is his biggest assets. Writing in a direct style, which may frustrate some, he manages to convey with persuasion the seismic shifts taking place in our world for the laypersons. What we are talking about precisely are the three pivotal points Friedman detects when society experienced such a radical paradigm shift that it is forever transformed. You may have already have heard of the three points he underlines, the technological revolution infiltrating every aspect of our lives, the inescapable globalization and climate change. What you may not know is the effects they are causing on all fronts: acceleration. Just as the universe is expanding faster, our world is shifting faster than ever, demanding us endless adaptability. Though you will not be bored reading this serious book, a measure of skepticism is required. Can the mindset that created our enormous problems the best tool to fix them? That question is never tackled. This book makes a huge assumption from the onset. How can it not? If you are young, out of college, living on your own, most likely you are broke. If you live at home, you’re probably close to broke as well. How else could it be? Burdened by galloping college tuitions, the prospect of months if not years of unpaid internships, millennials are trapped in a maddening cycle of financial paralysis as they struggle to pay off their bulging debts. How to survive in this financial jungle that seems to aim at your wallet on every street corners? How to avoid the humiliation when you go out with your crew, abstaining from eating, when everyone knows you cannot afford anything? If you stay up all night, unable to sleep, chances are that you are a millennial churning those questions in your head. But there’s hope on the way. 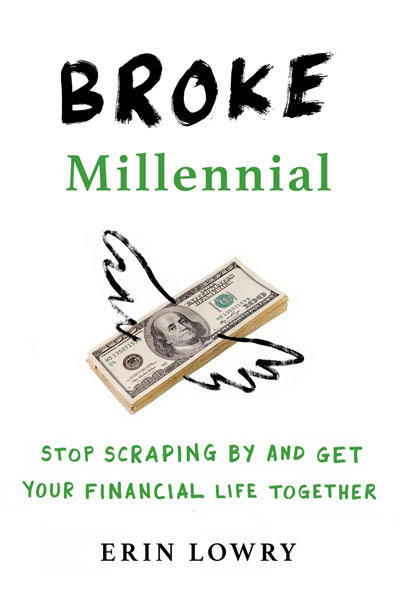 Erin Lowry has crafted an entertaining book for the financially clueless millennials, filled with real-life solutions. Entertaining because her style is cheeky and quite hilarious. She knows who she is talking to and how to reach her audience. She toys a lot with the relationship theme for example, a theme Millennials appear to be obsessed with, by bringing forth innovative terms. Getting “financially naked” with your partner implies getting honest about learning the “possibility of STDs” standing for here (sexually transmitted debt). Indeed making your bed with someone has never been so full of liabilities. It is not that Lowry has it all figured out for you, but she certainly can point you in the right direction to get out from under. “Broke Millennial” is a road map for the endlessly broke who are in serious need of a financial education. At the least, Lowry’s book is guaranteed to ease out the middle of the night panic attacks. This book is not about the ugly faces we currently are witnessing in the political arena (my comment is not misplaced), nor it is related to the Disney version of Hugo’s, “The Hunchback of Notre Dame” where the gargoyles of the famous cathedral come to life. 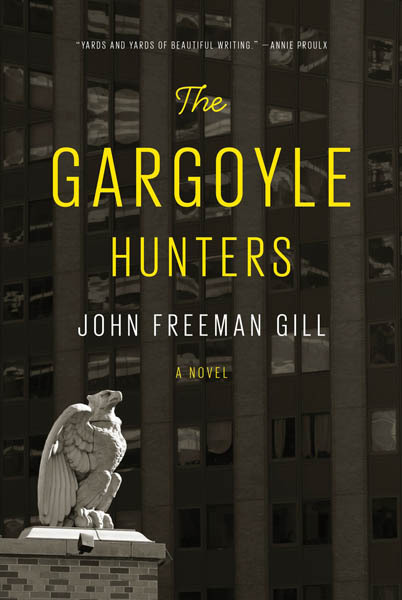 “The Gargoyle Hunters,” the first novel by John Freeman Gill, depicted here, are about the half-man half-beast creatures dangling from the New York architectural landscape and its buildings, a vanishing specie. They make like their French counterparts just as much noise, but the noise here carries the tone of silent suffering. There is a surprisingly great dose of nostalgia in this novel, in the way the gargoyles are used like an Ariadne Thread to capture the feelings of a departed family member or the memory of a distant relative. Artifacts against amnesia. The main protagonist of the novel is the thirteen-year-old, Griffin, who yearns to have a relationship with his estranged father, Gill. Too eager to have an innocent recruit help him with his preservation operation, Gill sent Griffin around the city to salvage and steal gargoyles and sculptures from dilapidated buildings. The city plays an important character in the novel. Under the constant impulse of urban renewal, which is in itself the manifestation in the blind faith of prosperity having no regard for the past, its history and cultural heritage . . . (must you hear Trump’s voice here? I leave the judgment to you), the city impacts how the characters relate to their world, especially as the city transforms itself into a cold monster of glass and steel towers, devoid of all the flowery embellishments of beaux-art architecture. The novel is not simply a coming-of-age journey of an adolescent straddling two opposite worlds, but a warm meditation on the importance of being nurtured and feeling grounded. Don’t think for a second however it comes easy.